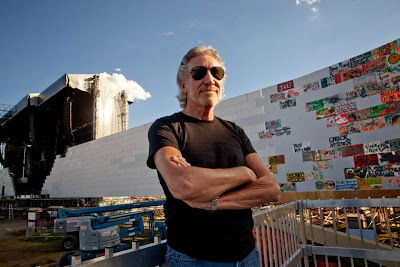 Roger Waters was on hand at the Toronto International Film Festival on Saturday to premiere “Roger Waters: The Wall”, a documentary shot during the former Pink Floyd member’s three-year solo tour, and video of his appearance is available. Waters introduced the film at the September 6th event and participated in a Q&A session after the screening. The Wall Live tour brought the famed 1979 Pink Floyd album to arenas and stadiums around the world between 2010 and 2013. Waters played 219 dates that brought in a total of approximately $458 million dollars in box office revenue. “Roger Waters: The Wall” was shot in three cities across two continents by co-directors Waters and Sean Evans. The film, like the piece of music on which it is based, is also drenched in Waters' politics and memories. Scarred by the fact that his father was killed in action in Italy in 1944, when Roger was not yet six months old, his work is a plea for peace and understanding — as "walls" create fear, misunderstanding, and often lead to war and death. “Roger Waters The Wall” includes a highly personal and moving journey through France and Italy as Waters visits the WWI cemetery in which his grandfather, killed in 1916, is buried, and the monument near the Anzio beaches on which his father's name is inscribed.